TheDoggieBox.com sent us a free box in exchange for an honest review. For more information on reviews and compensation, please see my Disclosure and Disclaimer page. As I’ve mentioned in previous posts, dog subscription box services can be a great way to try new products and save a few dollars. Guess what? There’s a new box on the scene! 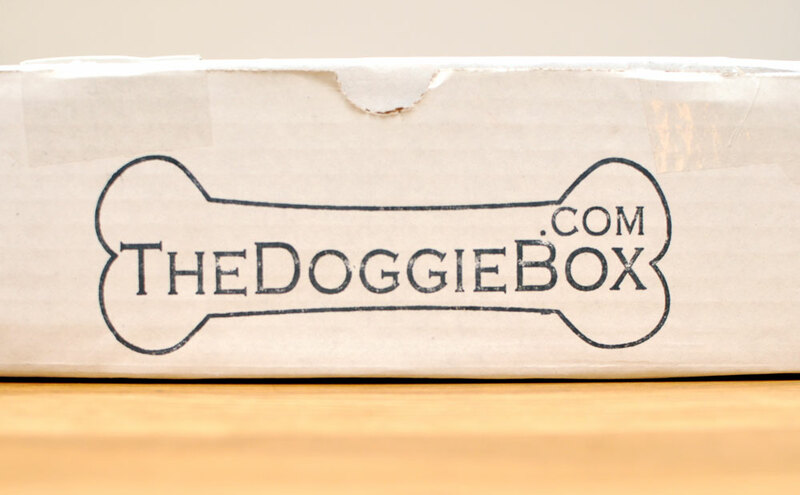 Meet TheDoggieBox.com, a new subscription box service based in Columbus, Ohio. They graciously sent us a free box to review, and I’m happy to show you what was inside and tell you how much Henry loved it! Maybe Henry is spoiled and believes that everything that arrives in a box is for him – or maybe he just sensed that this particular box held some especially yummy goodies. He let me know that he WANTED it! This packaging is absolutely adorable! It is so clever to put peanut butter-flavored treats in a peanut butter jar (and with a great punny name!). Henry loved these, and I felt inspired by the packaging to make a sandwich – before realizing that the only peanut butter jar I had was “Henry’s jar” that I let him lick out of during nail trims. I’ve heard of this company but haven’t tried anything from them. Henry usually has meat-flavored treats, but he loved these as well! They are the perfect size and thickness to break into smaller pieces to use for training. Henry LOVES anything he can chew, and I know this will be no exception! It’s another fruit flavor – I don’t think Henry’s ever tried a fruit-flavored chew! This cookie is BIG and BEAUTIFUL! It looks like a small cake and is beautifully wrapped and iced. This item would be the perfect gift for a pup you love! I hadn’t heard of The Lazy Dog before this box (they make the Yippy peanut butter treats as well) and I now know that they make some really cute products! Henry went wild over this, which is no surprise! As I mentioned, he loves everything he can chew. Since he had many products to taste test the first night we had the box, I broke it in half. He took his half to his “chewing spot” and kept hiding it from me when I tried to take pictures. Way to help me out, buddy! He enjoyed the second half just as much, and it kept him busy and out of my way while I made Irish soda bread. It’s so cute! Look at that smile! I almost feel bad giving this toy to Henry but, thankfully, he isn’t very destructive. Am I the only one who sometimes forms weird emotional attachment to cute dog toys? I am? Yeah, I figured. If you read my review of Pooch Paw Box, you’ll know that I love the idea of including a roll of poop bags in a subscription box! This is something that I use every day, so getting an extra roll is always helpful! I personally think it would be great if all dog subscription boxes gave customers the option to add poop bags onto their regular subscriptions. 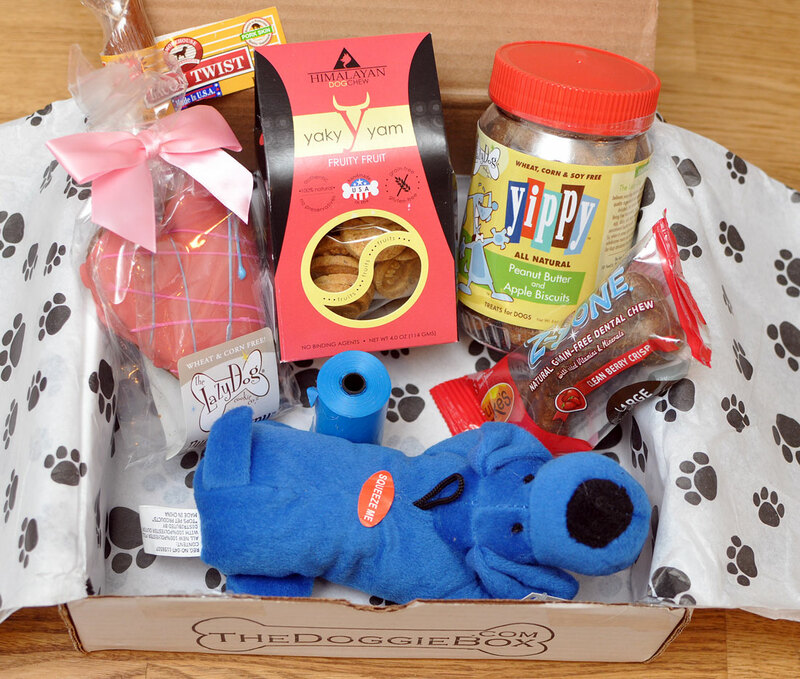 Looking for a dog subscription box to try? Consider TheDoggieBox.com! It came with great products and I learned about new brands and products that I had never heard of. Also – they included a handwritten note in the box! It assured Henry that they donate part of their profits to rescues and that all treats are made in the USA. How personal AND great! Check out TheDoggieBox.com at their website and their Instagram! 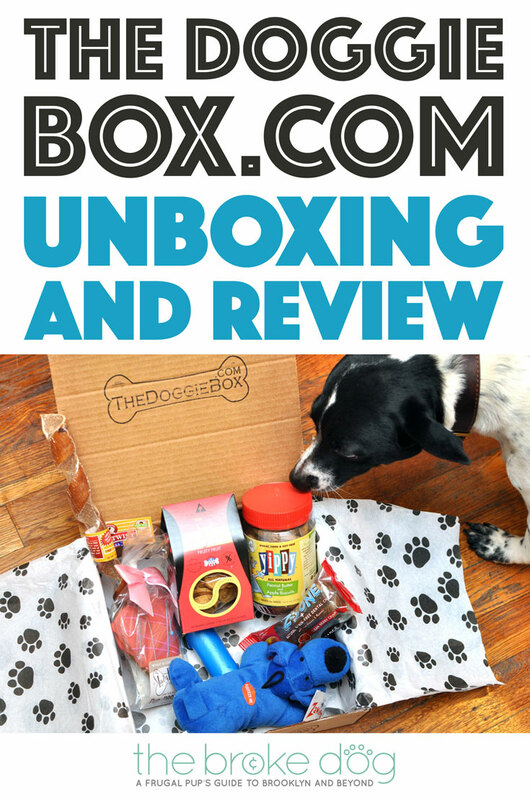 Learn about other subscription box services in our post Dog Subscription Boxes: How To Save and Have Fun! and under the Subscription Boxes category!